Did you know that all travellers visiting Iran need travel insurance to gain a visa? Why you should get your Travel Insurance with 1stQuest? It takes less than 5 minutes to apply and pay online. We’ll email you your policy within 2 business days. Get your policy straight to your inbox. Avoid lining up to buy insurance at the airport after you arrive. Don’t get caught with the wrong insurance. Buying your policy through 1stQuest guarantees your policy’s validity in Iran. How to get Iranian Travel Insurance? The whole process through 1stQuest is that you'll fill a short easy form and pay the fee online. In 2 days you'll receive the authorization letter, with which you can collect the visa stamp at the airport or Iranian embassy. We'll be there for your questions and concerns. Insurance services fee starting from €12.00, but the Final cost is calculated based on your age and trip duration. After saving for a while and doing research, you’ve finally decided to apply for Iran visa. Hooray! You’ve probably heard that you need a travel insurance for your trip, but you wonder “is it really necessary to get a travel insurance for Iran?” Well, the answer is short and simple: YES. Basically, there are two reasons for having a travel insurance for traveling to Iran; First, a travel insurance is required to collect your Iran visa; without having a printout of your valid insurance, you can’t collect your visa from the embassy or the visa office at the airport. Second, you don’t want the unexpected mishaps to ruin your long-awaited trip. A good travel insurance can protect you against mishaps and cover many unexpected and exorbitant costs. 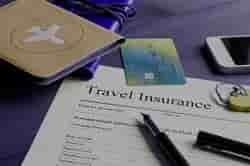 Can I use my existing travel insurance? If you already have a travel insurance, be careful because a travel insurance for your trip to Iran can be different from a travel insurance to other destinations. That is, many insurances sold outside Iran are not valid for a travel to Iran or at least some parts of Iran. The problem is that, due to the long history of political tensions and sanctions between Iran and west, many insurers do not put Iran in their destination lists. So, if you want to use your travel insurance for getting your Iran visa, make sure ‘Iran’ is clearly mentioned in their list. There are insurance companies which use general terms like ‘Asia’ or ‘Middle East’ in their lists, but even such terms are not acceptable for the visa officer. You can ask your insurance company to send you a document with “Iran” being mentioned in the list. How to get Iran Travel Insurance? If you don’t have a travel insurance or your travel insurance is not valid for Iran, you need to book a travel insurance for traveling to Iran. While there’s a choice of buying an insurance from the embassy or the visa office at the airport, with 1stQuest, you can book your insurance online. With 1stQuest’s online insurance service, in less than 5 minutes, you’ll book your Iran travel insurance at the lowest price and receive it in less than two working days.